It’s the Year of the Hound as Limavady complete clean sweep! Limavady Wolfhounds celebrate after defeating Moneymore to become the 2018 Derry Junior Champions at Owenbeg on Saturday. Limavady proved too strong for a resurgent Moneymore side as they completed a historic treble by claiming their first Derry Junior title since 2003 in front of 3,702 in Owenbeg on Saturday. Callan Bloomer got Moneymore off to a flying start, the big full forward landing two monstrous efforts before converting an 11th minute penalty. As expected, Limavady grew into the game with Oran Hartin shooting laser-precision kick-outs which were gratefully grasped by the hands of Sheagh McLaughlin and Callum Brown. Ruairi Hasson let the fuse for his all-conquering side, netting a fantastic goal to level the game 10 minutes before the break, Hasson and Cormac Quigley continuing to exert their dominance inside and finishing with 1-09 between them. Conan McAleese gave Moneymore a glimmer of hope by hitting the net with six minutes to play but the South Derry men finished the game with 13 men as Christopher Marshall and Patrick Devlin saw red. The game was merely three minutes old when Callum Brown embarked on his first driving run, darting at the heart of the opposition defence before being brought down. Ruairi Hasson stepped up to stroke over the left footed free. Both sides hit poor wides as county final day nerves played their part. Patrick Feeny edged his side ahead profiting from Bloomer’s ball winning skills by winning a throw-up close to his own goal. In the 11th minute, a fairly inconspicuous shot from Paudie O’Neill was spilled by Limavady keeper Hartin. Conan McAleese latched onto the ball and was brought down by Hartin forcing the referee to award a penalty. Bloomer stepped up to take the kick, slotting the ball into the bottom left corner. Cormac Quigley replied with a free for the Wolfhounds before Ruairi Hasson claimed a Richard King pass and slotted between the posts. The was one soon after with Moneymore struggling on their own kick-out after starting keeper, Stephen Barker, was forced off with an injury. Brown rose highest to claim possession before playing Quigley who fired over the bar with the possibility of a goal looming. Ruairi O’Kane continued the Limavady midfield dominance by latching onto a breaking ball, Hasson applying the finishing touches and once again the sides were level. With 20 minutes on the clock, Sheagh McLaughlin claimed a fine mark before feeding Hasson who continued his free scoring by finishing into the top left hand corner to give his side a lead they would never relinquish. Stephen McGurk pointed at the other end but the champions elect added further scores from Richard King and Hasson to go into half-time with a 1-07 to 1-03 advantage. Keen to get back into the game, it was Moneymore who started the second period brightest as Bloomer pointed. Cormac Quigley almost added a second major for the Wolfhounds only for his effort to strike the post, Ruairi O’Kane gathering the wreckage before tapping over the bar. Hasson finally got his side’s first score of the half three minutes in with a huge effort from near the side line. Patrick Feeny claimed the next kick-out, playing the ball long to meet Bloomer who beat his man out in front before turning and shooting over. Six minutes into the half, Limavady were once again denied a goal, Cormac Quigley’s shot bravely saved by Liam McInness before the rebound was blocked on the line by Aodhan Conway. Oisin Hasson was on hand to shoot over, soccer style to put six between the teams. Quigley and Oisin Hasson combined for the next score, Hasson taking a short free before turning and tapping over. At this juncture the men in yellow and blue were well on top, Quigley causing havoc inside and he was once again fouled allowing King to split the posts from the resulting free. King repeated the feat, minutes later, from a free south of the 45 yard line. 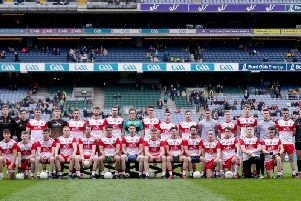 Ruairi Hasson added a left footed free before a meandering run from Aodhan Conway saw the full-back find Conan McAleese who blasted into the net with a serious number of players on the line. Limavady’s response was one of champions. First it was Ruairi Hasson who brought his tally to 1-06, before Sheagh McLaughlin capped a fine display with a score of his own. Conan McAleese showed resilience in the face of defeat, shooting over with the outside of his right boot. Quigley added another free before Moneymore were reduced to 13 when both Patrick Devlin and Christopher Marshall saw red. Veteran forward, Conor Forrest put the icing firmly on the cake knocking over a last minute free before the sound of the referee’s whistle confirmed Limavady as 2018 Junior champions, the ‘Hounds now representing Derry against the Down winners in two weeks’ time. Limavady: Oran Hartin, Jamie McLaughlin, Manus Quigley, Harry McLaughlin, Kieran McGlinchey, Conor Boyd, Aaron McGregor, Sheagh McLaughlin (0-1), Callum Brown, Eugene O’Kane (0-1), Richard King (0-4 3f), Ruairi O’Kane, Oisin Hasson (0-2), Cormac Quigley (0-3 1f), Ruairi Hasson (1-6 3f). Subs: Eoighan Rogers for R O’Kane (47), Mark McGroarty (0-1) for A McGregor (49), Conor Forrest (0-1 1f) for O Hasson (57). Moneymore: Stephen Barker, Rory Young, Aodhan Conway, Oisin O’Neill, Emmett Crozier, Stephen Scullion, Aaron Moore, Christy Young, Brian Marshall, Pearse McFlynn, Patrick Feeny (0-1), Stephen McGurk (0-1), Callan Bloomer (1-3 1f 1pen), Paudie O’Neill, Conan McAleese (1-1).